Not only does she help count and tag the monarchs every fall, Helen is employed as a devoted caregiver driving her special charges to and from physician and therapy appointments, or just driving - on outings to fresh air, to take in scenery, or simply to break the confinement of inside walls. Helen also helps others by generously sharing her love of nature and butterflies as illustrated in this lovely little story she recently wrote and then shared with me. She calls it “Driving Ms. Mattie"
“On Tuesday, November 1, 2011, it was warming up after a cool start to the morning. As we headed down Ms. Mattie’s ramp, I was walking behind her. Ms. Mattie was riding her scooter chair. She gave me one of those smiles that I had come to know, as she stood up using her walker to transfer from chair to car, that she was glad to be getting out of the house. On the drive from Sopchoppy to Newport, we talked about the changing fall landscape and places that had changed in our lifetimes while living in Wakulla County, she having more stories to tell having spent more than 80 years living there. Volunteer help is needed now with the 2012 Monarch Project encourages Helen. Volunteers can assist by recording data, counting, capturing, and tagging the migratory monarchs. Says David Cook, wildlife biologist and project manager, “We go on Saturdays so the public can join in, but days associated with cold fronts we go out too.” Cook explains that the secret is to find the trees and shrubs that are their overnight roosts. “We shine the flashlights to count them as they are closed up and sleeping and then capture them with nets.” On a total of nine mornings last fall, 2,865 monarchs were counted in St. Marks and 2,584 were tagged. Helen adds they also record data including present weather conditions, habitat vegetation and gender of individual butterflies. Even if you are not able to volunteer with the Monarch Project, you still have an opportunity to get up close and personal with the monarchs. 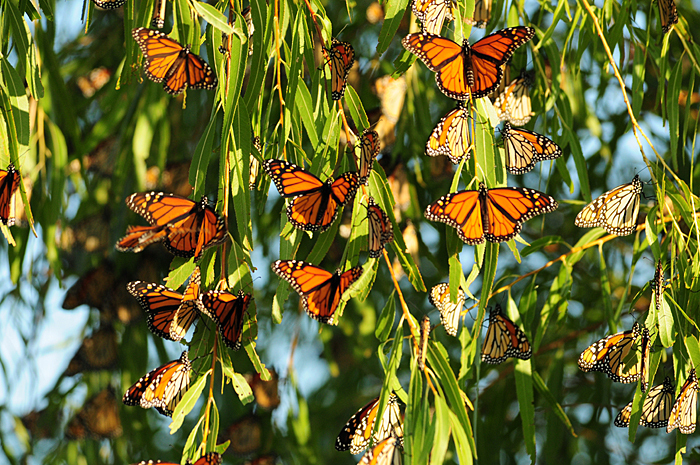 Plan to attend the 2012 St. Marks Wildlife Refuge Monarch Butterfly Festival, Saturday, October 27 when you can view thousands of the butterflies as they prepare for their long journey across the Gulf of Mexico to wintering grounds in the mountains of Mexico. This annual event celebrates the migration of the Monarch butterfly with tours, butterfly tagging demonstrations, presentations, live butterfly garden, butterfly plant sale, crafts, exhibits and more. The event runs from 10 a.m. to 4 p.m. at the Refuge, 1255 Lighthouse Road, St Marks, FL Call 850-925-6121 for additional festival information.